I’m here today to show you how Wargroove’s Puzzle Mode works, with plenty of visual aids! We wanted to get players thinking about the game a little differently by presenting them with a scenario where they only have one turn to win. Typically the objective is to win by defeating the enemy commander or by destroying their stronghold; however some puzzles change it up and require you to rescue a villager from dangerous situations instead. All of these puzzles are geared to test your understanding of the game’s mechanics and the various strengths and weaknesses of the units, with complexity increasing as you progress through them. To give you a clearer idea, I’m going to break down one of the very early, relatively simple puzzles for you fine folks, showing step-by-step how it can be completed. In the scenario above, we’re in control of Ragna and her forces. We can see that this puzzle has both an enemy commander and a stronghold surrounded by various infantry. You only need to take down one of them in order to win, so typically you want to pick one to focus on. In this case, we’re going after the stronghold, as we have determined that we do not have enough damage to take out the enemy commander in just one turn. At first glance, Ragna is too far to reach the stronghold or any of the units around it. However in this challenge, Ragna has her groove charged – as indicated by the blue aura – and is able to use Shield Jump to launch a devastating area-of-effect attack that damages all units and structures in the area. Given that our goal is going to require clearing those infantry from around the stronghold, this is a strong first move. A constant of Puzzle Mode is examining what targets or actions are available to each of your units, as the order you perform your moves can be critically important. Considering our goal is to take down the stronghold, we’d want to be looking at which of these units is best equipped to damage the structure. We have a knight that, if provided with a clear route, is capable of landing a critical hit on the stronghold, dealing a significant amount of damage. With that consideration in mind, we probably don’t want to be using it to clear out the already-weakened infantry. Our blue mage doesn’t do quite enough damage to the wounded enemy mage to kill it, however we can use it to finish off the soldier on the left! This opens up the way for our archer to move forward and take out the mage that is blocking our Knight. With the mage cleared, our knight is able to charge in and land a devastating critical hit. There’s only one enemy soldier blocking the way at this point, and both of our remaining units can kill it. With the realisation that our soldier can’t reach the stronghold, but the spearman can if the way is cleared, we have our soldier take out the weakened enemy soldier. This allows our spearman to swoop in and deliver the finishing blow to the severely-weakened stronghold! With that, we’ve completed the puzzle! Hopefully this has helped you to get a general idea of what Puzzle Mode is all about. The game will be shipping with a whole bunch of puzzles, and you’ll even be able to create and share your own with our included map editor. By default, new puzzle maps will use the standard objectives of defeating the commander or destroying the stronghold, but you can make these challenge objectives into whatever you’d like using the robust event editor. The only requirement for it to be a valid puzzle map is that it has to be beatable in one turn! I’ve had a lot of fun building these and coming up with scenarios that demand you make the absolute most of all the abilities available to you, so I’m really looking forward to seeing what kind of wild puzzle maps you guys come up with! I leave you now with a glimpse of one of the much later puzzles, so you can get an idea for just how much the complexity can escalate! 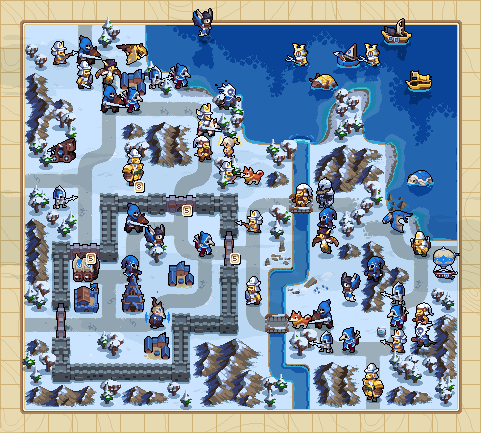 We’d love to hear your thoughts on Puzzle Mode, so come join us on the Wargroove Discord channel to chat to the Chucklefish team, or check in at the forums, Wargroove Twitter or the subreddit to keep up to date with all of the latest news. Bye for now!